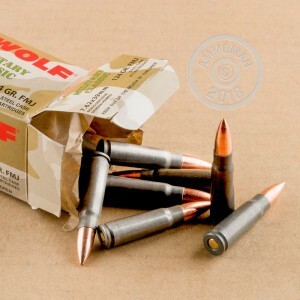 Wolf ammunition is highly popular among owners of Eastern bloc rifles such as the AK series and the SKS. 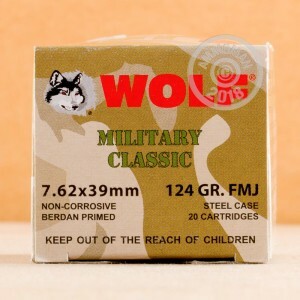 This 7.62x39 round, packaged in a case of 1,000 with 50 boxes of 20 rounds each, is ideal for these classic rifles and uses a non-corrosive Berdan primer for easy maintenance. The polymer-coated steel cases are not reloadable, but feed well and cost much less to produce, helping to keep your shooting costs down. These rounds use a 124 grain bimetal jacketed bullet which has some magnetic properties. The 7.62x39 cartridge is one of the most widely used in the world, and served as the standard Soviet assault rifle cartridge from the closing months of World War II until the 1970s. It is usually produced with steel casings due to Russia's abundant iron ore reserves; such ammo generally performs superbly in the AK-47 and SKS rifles chambered for it. The low cost of 7.62 ammo means you can shot a lot of it--and AmmoMan makes this even easier by offering free shipping for all orders $99. That means our case prices are the actual price you pay, with no additional S&H charges. I have an Arsenal SLR-101s (Milled receiver) with a simple Primary Arms red dot. I was able to pound a 12 inch gong at 200yrds with ease! This ammo is fantastic!! This stuff functions flawlessly in my WASR and Romanian SAR1. Tough to beat at any price and Ammoman is the best place to buy from. Casing split vertical when fired. Thankfully something bad didn't happen. First 3 rounds 13/4 at 100 yds. Best5shot group 11/8 inch 100 yds.